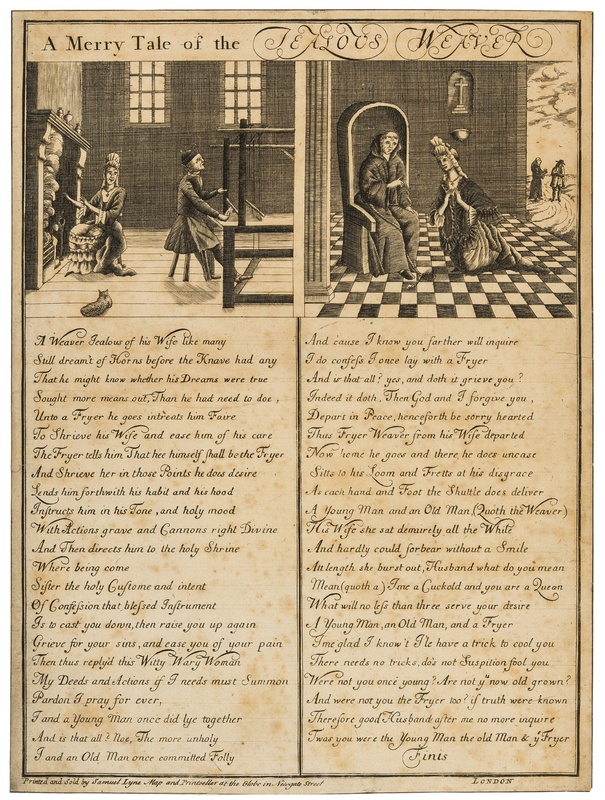 This weeks ‘random item spotted in an auction catalogue’ is a mid-eighteenth-century satirical broadside which offers some truly awful advice on how to build a successful marriage. Two columns of rhyming couplets tell the tale of a jealous weaver who disguises himself as a friar in order to trick his wife into unwittingly revealing her alleged infidelities. The wife duly confesses to having slept with a young man, an old man and a friar, only to later reveal that she was aware of the ruse and that three men she claimed to have slept with were the weaver at different stages of his life. It is accompanied by two engraved images showing the despairing weaver at work at his loom and then dressed as the monk taking his wife’s confession. Whilst the quality of the engraving leaves a lot to be desired when considered against the elevated standards of the period, the artist has included some nice touches, such as the lounging cat, which liven up the composition somewhat. What is perhaps unusual, or at least unexpected, given that this print was likely to have been published sometime during the 1740s, when Britons were vociferous in expressing a loathing of Popery, is that both the weaver and his wife are obviously Catholics (because the Anglican Church doesn’t practice confession and doesn’t have friars) and therefore not characters we would expect to see portrayed sympathetically in caricature. So it’s possible that this may have been a reworking of an earlier European print, or perhaps the artist simply couldn’t make the joke work without casting his two principle characters as practicing Catholics? The publication line reads “Printed and Sold by Samuel Lyne Map and Printseller at the Globe in Newgate Street. The BBTI lists Lyne as active from 1741 to 1748. 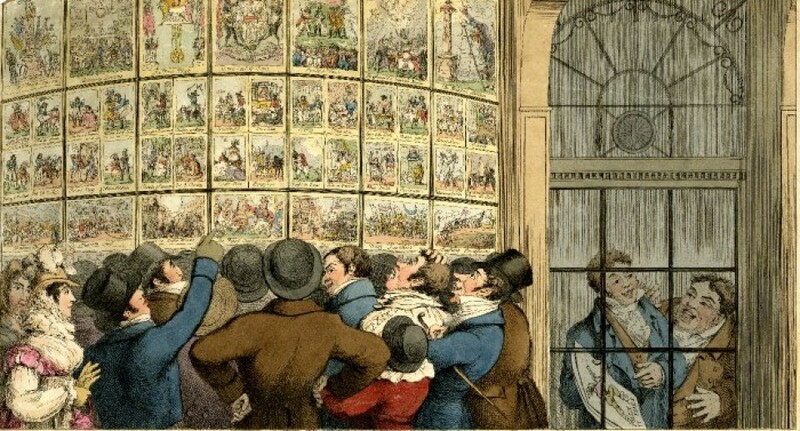 The British Museum has a small number of his prints and other items listed in its catalogue and it would appear as though he specialised in the publication of humorous prints and other ephemera (including trade cards and watch faces). The paper contains a large “Pro Patria” watermark suggesting it was probably manufactured in Holland especially for export to Britain (Britain’s own paper industry being virtually non-existent in this period). It’s valued at £400 – £600, which seems like a plausible hammer price given its age and apparent rarity. James Gillray’s caricature of Thomas Tyrwhitt Jones (1765 – 1811), entitled Independence (1799), was copied and used as a decorative design on English pottery during the early nineteenth-century. The potteries would employ an engraver to etch the desired image onto a copperplate. The plate was heated and inked in the normal way, before being overlaid with damp tissue paper and passed through a rolling press. The tissue paper was then peeled from the plate, wrapped around a piece of pottery and burnished to leave an impression on the body of the vessel. Finally, the pot was soaked in order to remove the paper and could then either be sold or passed to a painter who would add colour to the design. 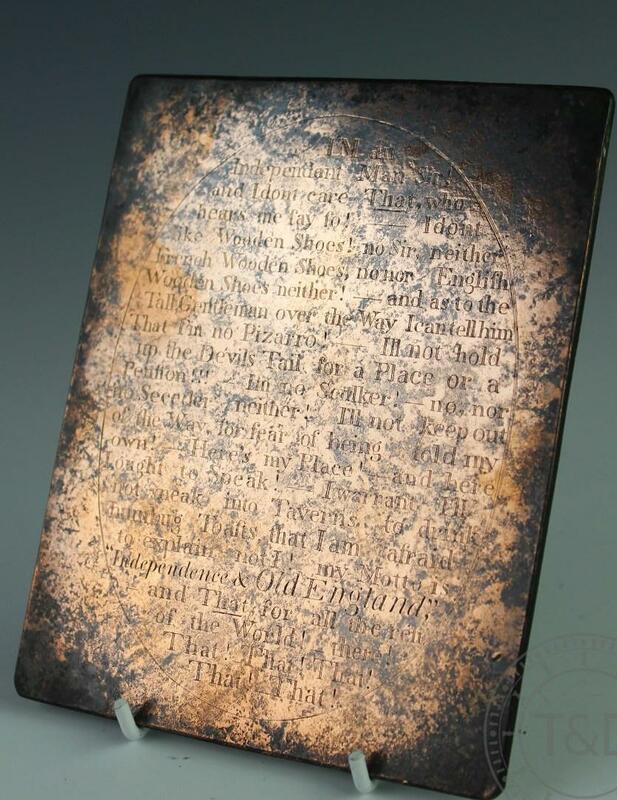 Copperplates used for engraving pottery transfer sheets can be distinguished from normal printing plates because the image, particularly the text, did not have to be engraved back-to-front. This was because image was pressed onto the inked underside of the wet paper, which was then lifted, placed onto the vessel and rubbed from the reverse side, meaning that it remained the right way around. This presumably made the whole task a lot quicker, easier and cheaper to accomplish than with conventional copperplate etching. This plate, which is coming up at auction in the next couple of weeks, was used to print the text which appeared on the obverse of jugs carrying the Independence design. I have included a image of a creamware jug carrying the design on the right and you can read more about this object HERE. It’s not unusual to come across eighteenth and early nineteenth-century satirical prints that have been modified in some way. Our ancestors treated these prints with far less reverence than we do, regarding them as tactile objects which could be cut, coloured, and otherwise amended after purchase. This interaction with printed satire is not something which has been particularly well documented by historians, probably because academics tend to rely on large institutional collections of perfectly-preserved caricatures, but it’s something with which most private collectors will be familiar. Modern amendments are something altogether different though, and would presumably only occur as a result of either accidental damage or gross ignorance on the part of the owner. I will let the reader decide which of those criteria applies to a former owner of this skit-note; for they, at some point during their custodianship of this 200 year old object, evidently decided that it’s appearance would be enhanced by the addition of fuzzy-felt stickers spelling out the title “Compensation Wanted” across the top of the print. Sadly the aesthetic impact of their modification has somewhat diminished over time, as the felt is now starting to fall off, leaving patches of white sticky-back plastic visible underneath. It’s a great shame, as this is an otherwise interesting and seemingly rather rare example of a satirical skit-note engraved by W.J. Layton of Oxford Street in 1810. The British Museum has a similar version of the note in its collection, but it’s of notably lower quality and is evidently a copy of Layton’s original edition. I Promise to pays Messrs. Cambridgeshire, Ryecastle, & Co. Bearer on Demand TWO PENCE when Englishmens grievances be recompensed when Foreigners are Banished from our Land, & Willm. Cobbett cease to expound Britons Cause. For the Govr. & Compy. of Integrity Innocence. The image of the slave and the reference to money appear to have convinced the former owner of this print that it related to the abolition of the slave trade in 1807. Unfortunately, it’s got nothing to do with the slave trade or African slavery at all. The figure of the slave is entirely symbolic and probably refers to the perceived oppression of the British people. The satire is actually about the radical political journalist William Cobbett, who was jailed in June 1810 for attacking the government’s decision to garrison German soldiers on British soil and went on to publish a series of open letters attacking the economic hardships imposed on ordinary working people by the disruption of trade, war taxes, and inflation of the currency. 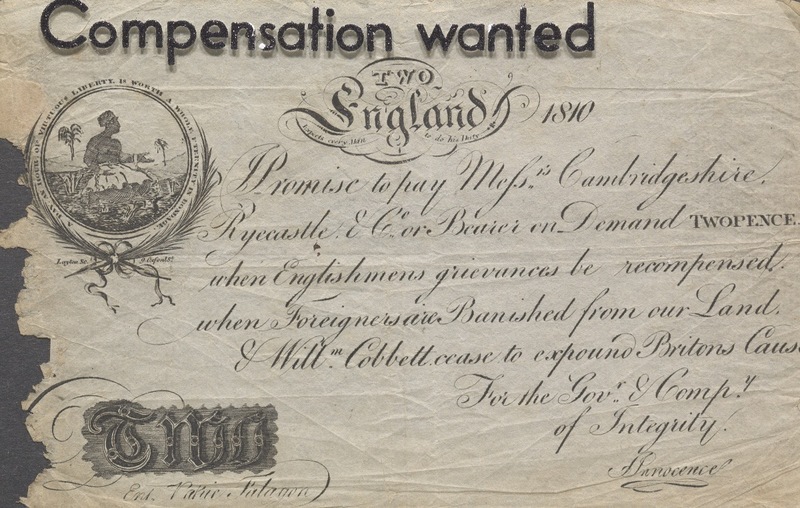 The note promises that the bearer will be able to exchange their paper money for cold hard cash when the reformist cause is won, the King’s German Legion have been sent packing, and Cobbett has no more cause to complain about the government’s conduct. Sadly, the misinterpretation of this image means that not only has someone spoiled an antique print, but that they’ve also spoiled it for entirely the wrong reason! The notes’ coming up for auction in the US in a couple of weeks time. The estimate’s £200 – £350, but I’d want to be pretty certain that those sticky letters will come off before paying that kind of money for it. 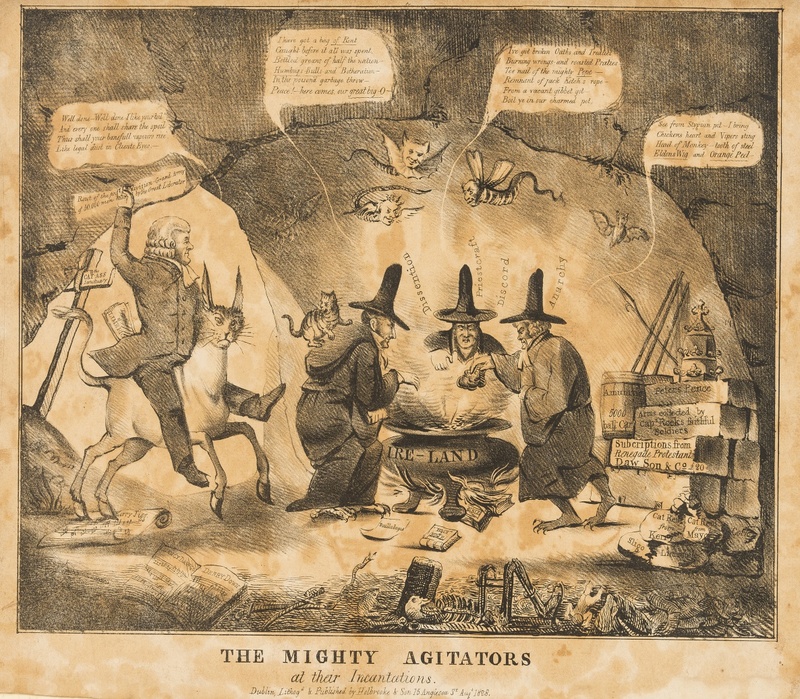 A few years ago, I wrote a rather lengthy post on the satirical print trade in Dublin during the eighteenth and early nineteenth-centuries, and since then I’ve always been interested in any Irish prints that happen to cross my path. I spotted this one in a sale catalogue the other day and thought it was worth writing about. In the centre of the cave, O’Connell’s fellow Catholic Association members are gathered around a large cauldron in the manner of Macbeth’s three witches. They each intone their own rhyme as they attempt to summon up a revolution, the lyrics of which collectively refer to the various strains of popery, criminality, and deception that they hope to visit on the Irish people. Arms and other military stores are stockpiled to their right. The cases engraved with the words “Arms collected by Captain Rock’s faithful soldiers” and “Subscriptions from renegade Protestants. Dawson & Co”. The latter is a reference to George Robert Dawson, Sir Robert Peel’s brother-in-law, who had outraged Irish Protestants by delivering a speech at an Orange Order dinner on 12th August 1828 in which he expressed sympathy for the Catholics plight and urged the audience to accept their emancipation. The rest of the cave is littered with disparaging visual references to Irish nationalism, Catholicism, rebellion, and war. The print provides a disparaging commentary on O’Connell’s victory in the Clare by-election of 1828. Catholics were barred from holding office as MPs under the terms of the Act of Union of 1801. However, the law did not specifically prohibit them from running for election. By fighting and winning a by-election, O’Connell precipitated an immediate constitutional crisis, forcing the government to choose between violating its own anti-Catholic laws and unconstitutionally disenfranchising Irish voters. As politicians in London struggled to solve this conundrum, the mood in Ireland grew ugly. The Catholic Association began preparing for large-scale public demonstrations against the decision to bar O’Connell from office, whilst Protestant groups also began mobilising for armed confrontation with the Catholic majority. Eventually London, fearing that the country was on the brink of a rebellion, forced an emancipation bill through a reluctant House of Lords, abolishing a raft of discriminatory legislation which dated back to mid-seventeenth-century. The print was published by Holbrooke & Sons of 15 Anglesea Street, Dublin, in August 1828. This was the firm of John Holbrooke, or Holbrook, an engraver and printer who later went into business with his son William. An early twentieth-century dictionary of Irish artists states that Holbrooke senior was born in 1778 and attended the Dublin Society School (the Irish equivalent of the Royal Academy) from 1790 onwards. His business at 15 Angelsea Street appears in Dublin trade directories for the period from 1815 to 1830 and is consistently described as that of an ‘engraver and copperplate printer’, although all of his surviving works are lithographs rather than copperplate etchings. By 1838, the business had passed into the ownership of William Holbrooke (fl.1828 – 1848) who later relocated it to Grafton Street and Crow Street before emigrating to America. Like most satirical prints of this era, the image speaks to the political views of middling and upper class consumers drawn predominately from the ranks of Ireland’s Protestant community.